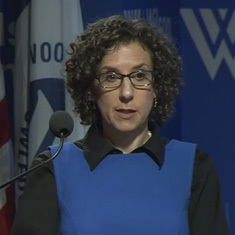 “There’s a common myth that migrant girls are forced to move against their will, but in fact what we’ve found through our research is that most migrant girls are involved in the decision to move,” said the Population Council’s Miriam Temin in this week’s podcast. Temin spoke at the launch of her and her colleagues’ new report, Girls on the Move: Adolescent Girls and Migration in the Developing World, about the economic incentives for girls to migrate and the risks involved for them. The preface of the report says that without proper support, girls can become more and more isolated and more prone to abuse and economic exploitation. “Migrant girls need safety nets which help them gain access to social support, recognizing that they’re less likely to have it than others,” said Temin. Download Temin’s slides to follow along.